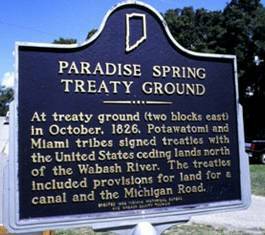 In October, 1826, Potawatomi and Miami tribes signed the Treaty of Paradise Springs, ceding lands north of the Wabash River to the United States and opening up our region to settlement. 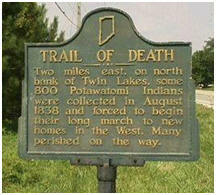 This treaty and others eventually led to the forced removal of Native Americas in the infamous Trail of Death in 1838. Distinguished author and local historian Shirley Willard will explore the history of these treaties and their impact on the Potawatomi at the monthly program hosted by the North Manchester Historical Society on Monday, May 11, at 6:40 p.m. in the Timbercrest Assembly Room. Shirley Willard grew up on a farm in the Mt. Zion neighborhood south of Rochester, graduating from Rochester High School and Manchester College and going on to earn MA from Ball State. She taught English, history, Spanish and journalism for 14 years. Willard was a charter member of the Fulton County Historical Society, and was the first secretary in 1963. She served as FCHS president 1971-2001, spearheading the building of the Fulton County Museum, Round Barn Museum and Living History Village. She founded the Trail of Courage Living History Festival in 1976. Willard has written, edited and published books and newsletters for FCHS, its Genealogy Section, the Potawatomi Trail of Death Association and other organizations. 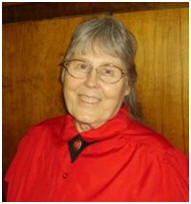 She continues to volunteer as a writer for FCHS and as Fulton County Historian. The program will be held in the Assembly Room of Timbercrest Senior Living Community, 2201 East Street. There is no cost for the program, which is free to the public. All are welcome. While many attend only the program, the public is also invited to come to the Assembly Room at 6 p.m. for a meal prior to the program. For those who wish to attend the dinner, reservations must be made no later than noon on Friday, May 8. The cost of the meal is $8.50, $3.50 on the Timbercrest meal plan. The menu is baked fish with tartar sauce, garden rice, broccoli, coleslaw and apple pie. Reservations may be made by calling Evelyn at 260-982-6777, Mary at 260-982-1813 or the Center for History at 260-982-0672. For more information call the North Manchester Historical Society at 260-982-0672. Historian and author Shirley Willard.